Forty-five years ago, on Yom Kippur at 2pm, the armies of Syria and Egypt simultaneously attacked Israeli positions at the Suez Canal and in the Golan Heights. It was the beginning of the Yom Kippur (or October) War. With the exception of the 1948-49 Israeli War of Independence, it would be the costliest armed conflict for Israel in its history. Some three thousand Israeli soldiers were killed in three weeks of fighting. Several thousand became prisoners of war, many of whom were abused or tortured. Some did not survive. As a percentage of the total population, four times as many Israelis fell in October 1973 than Americans did during the entire Vietnam War. Consequently, Israel’s chief of staff David Elazar, military intelligence chief Eli Zeira, Defense Minister Moshe Dayan and, finally, Prime Minister Golda Meir all resigned. The conflict became a national trauma from which Israeli society has yet to recover. Understanding the impact of a war does not mean reconstructing battles with tin soldiers, topographical models or – today – computer animation, but analyzing the conflict’s political and strategic significance. With his brilliant work On War, the Prussian military philosopher Carl von Clausewitz (1780-1831) left us an array of instruments to analyze wars that remains sound even today. Clausewitz’ philosophy is encapsulated in his assertion that “war is the mere continuation of politics by other means.” Perhaps no other sentence is distorted or, especially, misunderstood at the political and strategic level as this one. With it, Clausewitz clearly establishes and repeatedly underscores the primacy of politics. This means that the outcome of the fighting, or the victory on the battlefield, is secondary. What matters more is what politics makes of military events. In the October War, no one grasped and vigorously exploited the political dimension of the fighting better than Egypt’s president Anwar el-Sadat. The Israeli side did not have this deep sense of politics and strategy. This is all the more astonishing given that the Israeli chief of staff was Moshe Dayan, who was recognized around the world as an outstanding commander and shrewd politician. Yet before and during the war, Dayan and his government leader Golda Meir committed grave errors, both in judgment and decision. As a result, despite its military successes, Israel lost the war politically. And although his armies were defeated, Sadat won. How could it have come to this – and what can we learn from it today? The origins of the Yom Kippur War lay in the previous Arab-Israeli conflict, the Six Day War of 1967. In the space of just a few days, Israel decisively defeated the combined armies of Egypt, Syria and Jordan. Israeli troops occupied the Sinai Peninsula, the Golan Heights and the West Bank. The Israeli army stood at the Suez Canal, within 50 kilometers of Damascus, and at the Jordan River. Israel’s first prime minister, David Ben-Gurion, was already warning against euphoria. But both the government and military top brass were set on staying where they were. The Suez Canal was “the best anti-tank ditch,” Dayan said. The Arab governments refused to accept defeat. Egypt began a campaign of attrition at the Suez Canal. The casualties Israel suffered from Egyptian shelling were untenable in the long term. Israel therefore agreed to a truce on the basis of the status quo. The Israelis kept their side of the deal even after Egypt deployed its Soviet-made anti-aircraft systems the following night directly along the Canal. That effectively neutralized Israel’s strongest weapon, its air force – because Israel wanted to avoid fresh casualties under any circumstances. When Sadat, who became Egyptian president in 1970, offered Israel peace talks under the condition that it evacuate the Sinai Peninsula, the Israeli side refused. Israel kept this stance all through the following years, whilst Egypt and Syria rebuilt and modernized their armed forces with Moscow’s help. In early October 1973, Israeli intelligence reported that the Egyptian and Syrian armies were ready for war. Elazar, the Israeli chief of staff, clamored to mobilize the army. Yet Defense Minister Dayan dismissed the demand as unnecessary. Military intelligence chief Eli Zeira likewise saw little danger of war, pointing out that Israel’s armed forces or IDF far outclassed their Arab enemies. When Elazar insisted on reinforcing the troops at Suez and on the Golan Heights on the basis of intelligence reports, Dayan finally consented in a remarkable manner: Two hundred IDF tanks were to face 2,000 Syrian tanks. 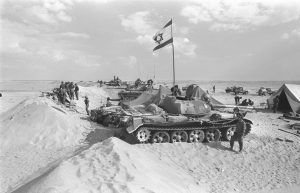 In the south, where 200,000 Egyptian troops and more than 2,000 Egyptian tanks stood poised to invade the Israeli-occupied east bank of the Suez Canal, Dayan authorized the deployment of 150 Israeli tanks. These IDF forces would suffice to deter the Arab armies and political leaders from attacking, Dayan believed, citing his victories in the 1956 Sinai War. Dayan’s decision was suffused with arrogance, perhaps even megalomania. He was certain that a modest amount of Israeli armor was enough to hold back an enemy with a ten-fold superiority in numbers. Dayan also counted on the Israeli Air Force as the ace up his sleeve. But Dayan’s assessment was more than hubristic. His analysis was superficial strategically and, what is worse, ill considered. Along the 160 kilometers of the Suez Canal, Israel maintained only 12 bunker complexes manned by 1,000 troops in total. Even the most upbeat Israeli generals doubted that these would suffice to hold out against a direct attack by 100,000 Egyptians supported by masses of artillery. The former commander in chief of the south front, Ariel Sharon, a proven commander during the Six Day War, considered the strategy of holding the Canal’s east bank with a handful of strong points “dangerous nonsense.” The inferior Israeli bunkers sufficed at most for enemy observation, Sharon said, adding that they would never withstand an Egyptian attack. He recommended a more flexible approach instead. The IDF should pull back about 30 kilometers from the Canal to the Sinai mountains at the Mitla and Gidi Passes and await the Egyptians from secure positions there. Dayan agreed with his maverick subordinate in principle from a military standpoint, but considered the flexible strategy politically unacceptable. For as soon as Israel withdrew from the Canal’s east bank, he was sure the Egyptians would occupy it and, from this advanced position, draw Israel into a conflict of pinpricks. Hence, the IDF had to hold out at the east bank for political reasons. The Israeli forces at the waterway were certainly outnumbered, but the IDF also counted on its greatly effective air force, which had determined the 1967 Six Day War. People – including politicians and military officers – often rely on experience, even if events have since overtaken the realities of the past. To carry out his strategy, Dayan appointed General Shmuel Gonen, an inflexible enactor of orders, to command the south front. During the night of October 6, military intelligence received direct information that Syrian and Egyptian forces would simultaneously attack Israeli positions the following day. In an emergency meeting at first light, chief of staff Elazar demanded authorization for a preemptive strike by the Israeli Air Force against the poised enemy positions. Prime Minister Meir and Defense Minister Dayan rejected the demand – Meir because she foresaw that Israel would need US support in any future war. Dayan, on the other hand, was sure that Israel’s highly modern air force would inflict such high casualties on the advancing Syrian and Egyptian armies that these would then be engaged and thrown back by Israel’s battle-ready ground forces. Despite repeated warnings from his chief of staff, Dayan did not budge from this position. In this darkest hour, strong personalities rescued Israel from disaster. Prime Minister Meir recalled General Haim Bar Lev from retirement to command the southern front. 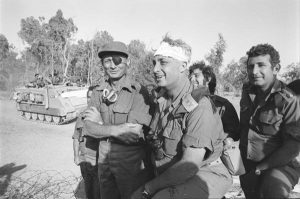 The armored reserve was entrusted to the likewise reactivated Ariel Sharon, so that Elazar could finally send the IDF back on the offensive with a fighting spirit. For days Sharon searched for the Egyptian army’s weak point. On the tenth day he discovered a gap between the Egyptian 2nd and 3rd Armies, and promptly attacked with his armor. Defying the explicit orders of the general staff, Sharon crossed the Suez Canal on a single bridge. He attacked the Egyptian SAM installations, thereby enabling the Israeli warplanes to join the fight effectively for the first time in the war. Through his bridgehead on the African continent, Sharon surrounded the Egyptian 3rd Army in the following days and then advanced on Cairo. Sharon’s troops celebrated him as the “King of Israel.” This was the beginning of Sharon’s mystique, which would help propel him decades later to the office of prime minister. The Golan Heights became the scene of bitter fighting. Only slowly did the Israeli reserve units manage to first halt the Syrian advance and finally turn it back. After two weeks, the IDF was on the offensive in both the north and the south. Israeli forces were advancing on both Cairo and Damascus. Following the encirclement of the Egyptian 3rd Army and the invasion of Africa, the Egyptian leadership became caught up in confusion, resignation and panic. The general staff wanted to pull all forces back to defend the capital Cairo. But, like his Israeli rival Golda Meir, President Sadat kept his nerve. He turned his attention from the units that were cut off in Suez and concentrated instead completely on the political field. 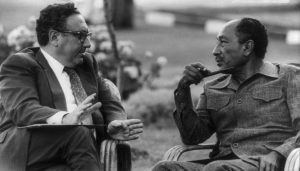 In US Secretary of State Henry Kissinger, Sadat found a sympathetic partner to work toward a new peacetime order. The Egyptian’s efforts paid off because he believed the military was only a means toward a political end. Israel, on the other hand, suffered a long-term political defeat and heavy loss of life despite its victories on the battlefield. Today Israel’s government is more careful. It resolutely strikes at Iran’s units and hardware in Syria. But against Russia’s modern weaponry, Israel is powerless. Hence, Benjamin Netanyahu tries to maintain cordial relations with Vladimir Putin. Yet Israel relies first and foremost on the United States, despite an erratic Donald Trump. The US has been Israel’s decisive political and military insurance policy ever since the Jewish state’s inception. The decisive factor, however, is Israel’s readiness to fight and make sacrifices. This is the foundation for peace – and, if necessary, for an existential war.